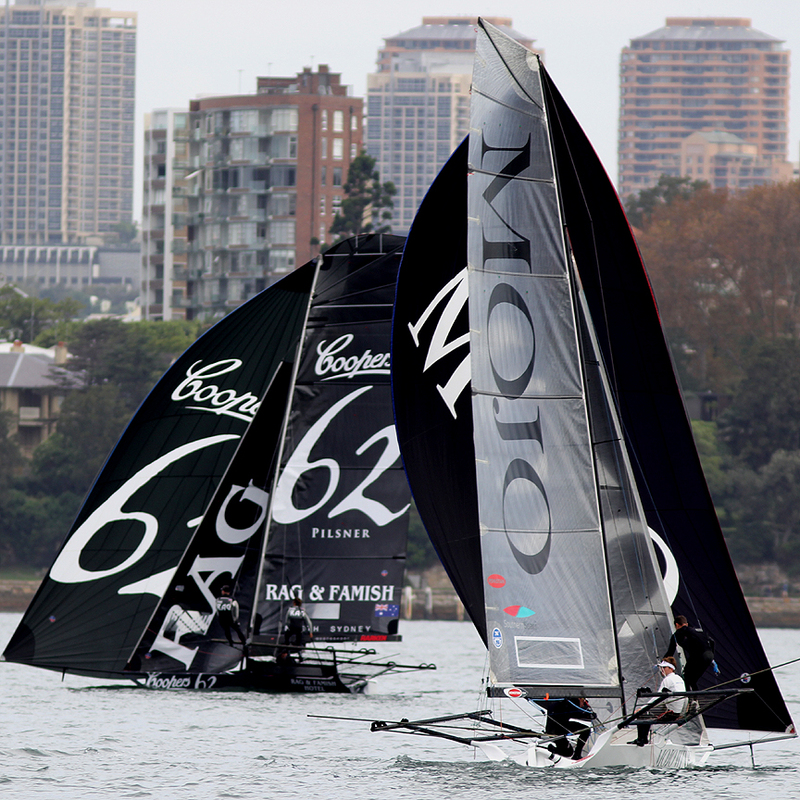 Coopers 62-Rag & Famish Hotel took out Race 10 of the Australian 18 Footers League’s Club Championship in a course shortened race on Sydney Harbour today. 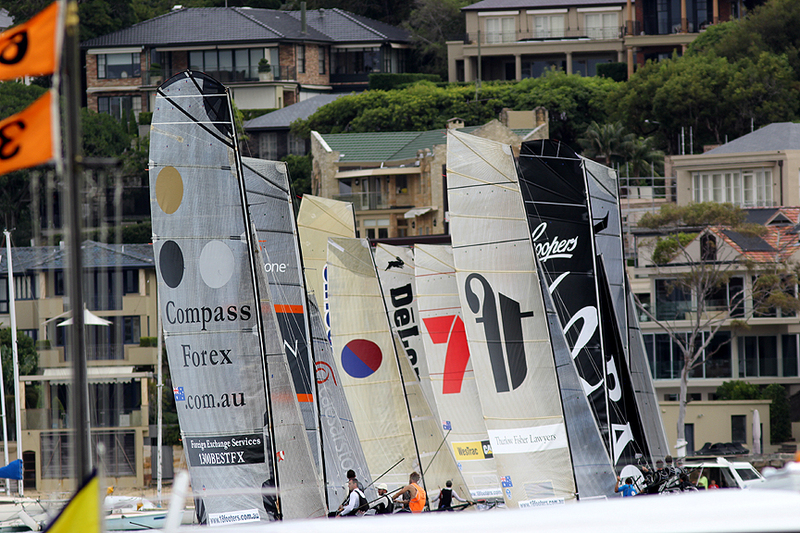 Following an earlier storm, the wind dropped and when many teams elected to go with their smaller number rigs, the race became a battle only for the bigger rigged boats. Jack Macartney, Mark Kennedy and Peter Harris soon had Coopers 62-Rag & Famish Hotel in the lead over the windward-return course and held a 1min lead at the windward mark. 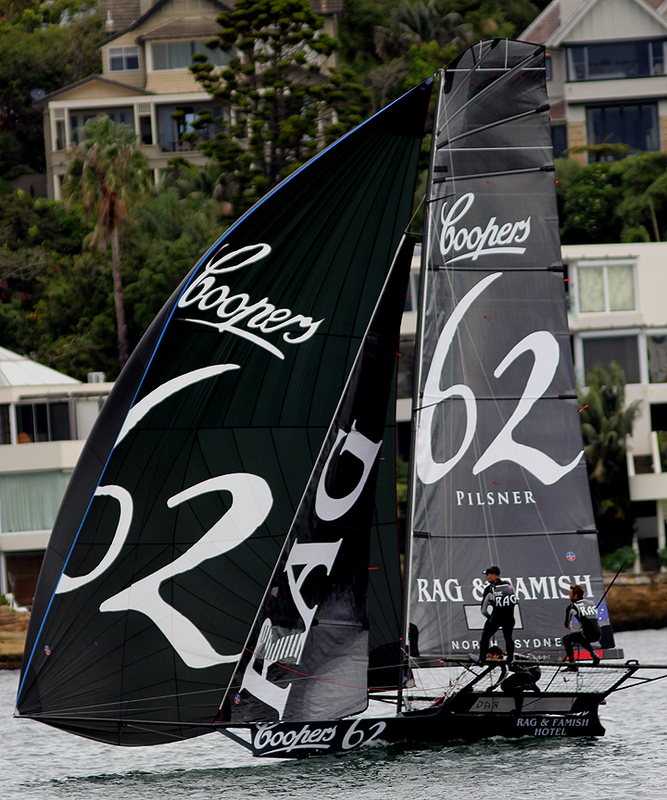 As the breeze gradually faded during the race, Coopers 62-Rag & Famish Hotel continued to hold a sizeable lead and was never in danger of defeat. 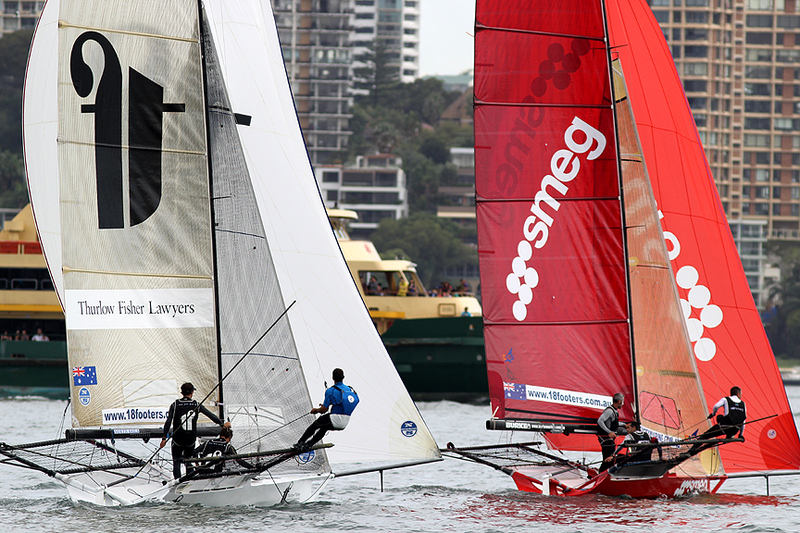 At the finish, Coopers 62-Rag & Famish won by 1m36s from Thurlow Fisher Lawyers (Michael Coxon, Dave O’Connor and Matt Stenta), with Smeg (Nick Press, Dan Phillips and Geoff Bauchop) a further 1m57s back in third place. 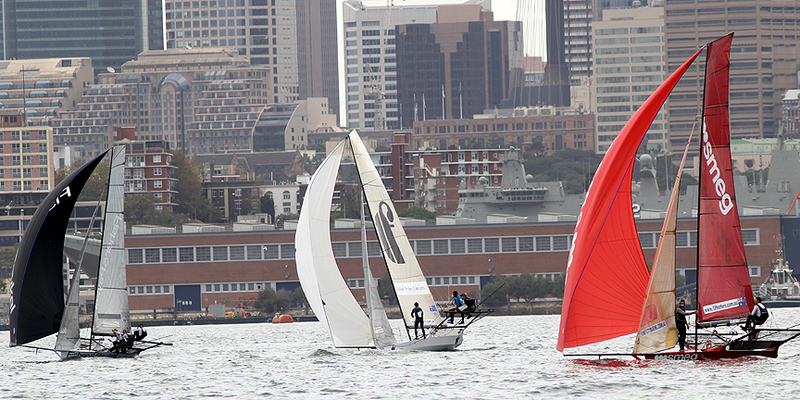 Thurlow Fisher Lawyers’ second place today has given the team a two points lead over Gotta Love It 7 in the club championship, with only one more race in the series to be sailed (30 March). Thurlow Fisher Lawyers has a total of 39 points, Gotta Love It 7 (Seve Jarvin) 41, Coopers 62-Rag & Famish Hotel 59, Smeg 61, Lumix (Jonathan Whitty) 71 and Mojo Wine (Chris Nicholson) 72. In today’s race, while ‘The Rag’ was a clear leader throughout, the battle for minor placings was always close. 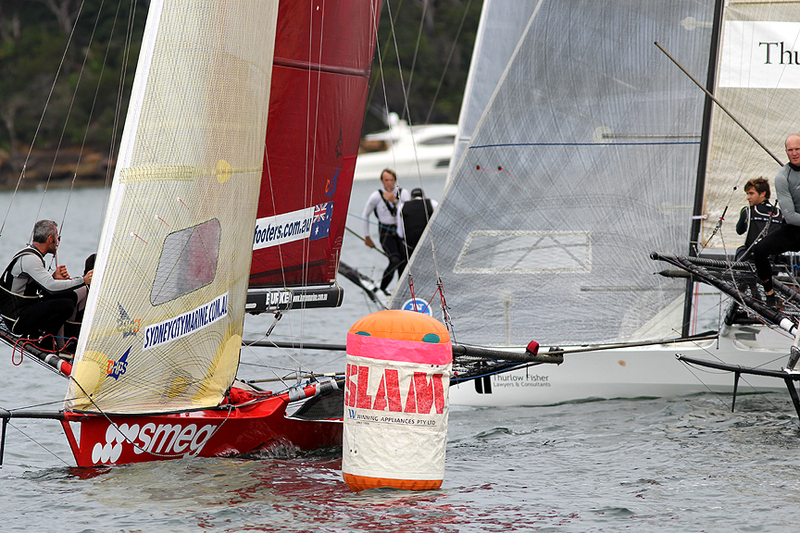 Mojo Wine, skippered by Andrew Chapman, replacing Chris Nicholson, held second place for the first lap but was unable to hold out series leader Thurlow Fisher and Smeg.